Gretchen Gerzina joined the Commonwealth Honors College as dean on July 1, 2015, and was named the Paul Murray Kendall Chair in Biography in April 2016. 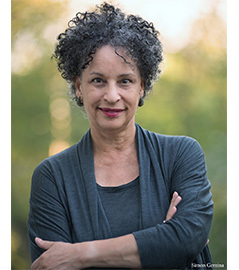 Gerzina came to UMass Amherst after ten years as a named professor at Dartmouth College where she held the Kathe Tappe Vernon Professorship in Biography, and served as chair of the English department and later as chair of African and African American studies. Previously she spent fourteen years as a professor of English at Vassar College where her administrative positions included being founding director for Teaching and Learning, and associate dean of the faculty, followed by two years as a professor and director of Africana studies at Barnard College, Columbia University. She holds a doctorate from Stanford University, a master’s from Simmons College, and a bachelor’s degree from Marlboro College. Her seven books, most of them historically-grounded biographical studies, have been widely reviewed. Carrington: A Life (1989) is the biography of Bloomsbury figure Dora Carrington. Black England: Life Before Emancipation (1995) was a New York Times “notable book of the year” and was published in America as Black London. Frances Hodgson Burnett: The unexpected life of the author of The Secret Garden (2004) was the first biography of Burnett in over thirty years and drew upon previously unseen caches of family letters and journals. Her most recent book, Mr. and Mrs. Prince: How an Extraordinary 18th-Century Family Moved out of Slavery and into Legend (2008) recounts the story of two former slaves, Abijah Prince and Lucy Terry Prince, of colonial Massachusetts and Vermont, who became landowners and public figures, successfully defending themselves in court. She also is the editor of three books: Black Victorians/Black Victoriana (2003); the Norton Critical Edition of The Secret Garden (2005) and The Annotated Secret Garden (2007). She has also published numerous articles. Gerzina appears regularly on radio and television in both Britain and America. From 1997 to 2012 she hosted the nationally-syndicated public radio program “The Book Show,” and has done commentaries on National Public Radio and Vermont Public Radio. She recently completed a ten-part BBC Radio 4 series on Britain’s Black Past that will air in January 2016. She is the recipient of two grants from the National Endowment for the Humanities, and has been the Fulbright Distinguished Scholar to Great Britain. Gerzina was an honorary visiting professor at the University of Exeter in Devon, England, and in 2009-10 she was the George Eastman Visiting Professor at Oxford, where she was given an honorary master’s degree by Balliol College. More information about Professor Gerzina can be found on her website: www.gretchengerzina.com.